Our beautiful princess, Sue, joined her prince Steve Brown on Friday, March 29th. Born April 27, 1957 in Salt Lake City, Utah, her life was difficult and full of challenges. Shocking everyone she persisted, demonstrating resilience and persistence against a lifetime of disability, illness, and injury. Through her strength Sue fostered a connection with everyone around her. Sue had an implicit language, in which she conveyed her love for others. With hugs and nods she affirmed and comforted us. Tapping and touching her forehead to ours she felt into our struggles and listened to our trials. Sue’s smile was infectious, lifting spirits no matter how turbulent your day had been. Sue had a niche pallet for the finer things in life, such as Pizza, Spaghetti, Chocolate, Cheeseburgers, Coke, M&Ms, and “Piku” (ice cream). She was always willing to help in the kitchen especially taste testing. She enjoyed magazines, coloring, crafts, cuddles, lullabies, and being spoiled. 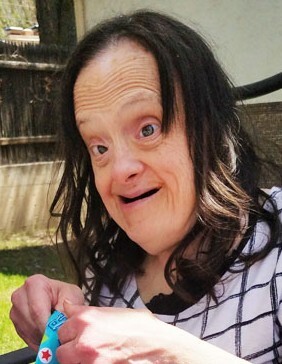 Sue savored time swimming, shopping, watching movies with popcorn, and sitting in the sun on summer days. She was close to her roommates, familiar with them as though they were brothers and sisters. Everyone doted on her and wanted to ensure her happiness at all times. Her roommates loved helping her and in return she showered them with love and affection. Sue carried a maternal spirit which she demonstrated in how she cared for dolls and those closest to her. Preceded in death by her friends, Maria, Mary, and Steve. She is survived by her loved ones and caretakers. She will be dearly missed. We lalala-love you Sue. Funeral services will be held Thursday, April 4, 2019, at 1 p.m. at Goff Mortuary, 8090 S. State St., Midvale, where there will be a viewing one hour prior to services.